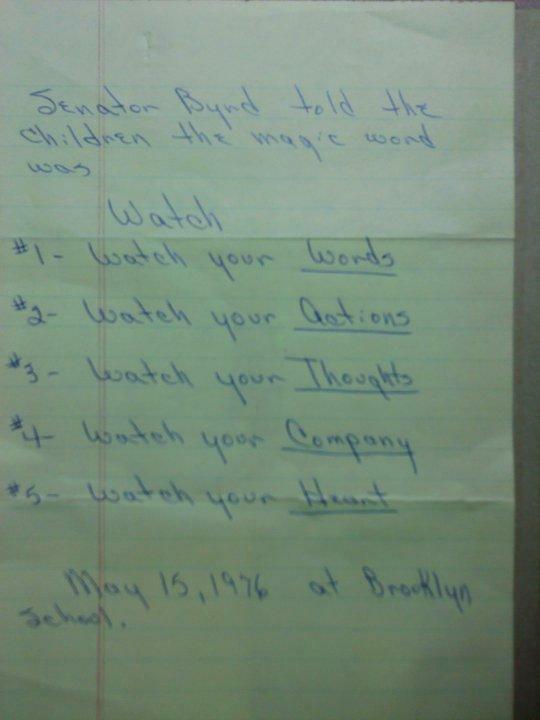 Mrs. Colleen Coffield made notes on Senator Byrd’s 1976 speech to her fourth grade students in New Martinsville, WV. Bob Coffield, an attorney specializing in health care, recalls being one of those starry-eyed students. He found the note among his mother’s papers. I just Googled Peter Sagal to learn more about the host of Wait, Wait, Don’t Tell Me, a public radio show I sometimes listen to on Sunday mornings as I make my way to church. Yesterday, I believe it was Mr. Sagal who was exercising his right of free speech to ridicule our newly canonized patron saint, Senator Robert Byrd, who is not yet buried. It was fitting that Mr. Sagal was doing so on Mr. Byrd’s favorite holiday, July 4th. I’m primed to laugh when I tune into Wait, Wait, but yesterday morning my good humor was spoiled as I listened to Mr. Sagal launch a snide attack on the legacy of Senator Byrd. His question, concerning sculptor Bill Hopen’s statue of Senator Byrd in the West Virginia’s State Capitol Rotunda, posed three answers. The answer was number two, that the hands of Hopen’s statue point toward the pockets of the American people, implying that Byrd picked our pockets. He introduced Byrd as the West Virginia politician who was fond of naming his pork projects after himself. Question: Has Peter Sagal subjected himself to noxious fumes that have impaired his judgment, or is he at worship? Kasell speaking, and was surprised that a veteran newsman would make a mistake like that. Newsfolk who work in Washington can find much to satirize, but it’s only funny when it’s true. The truth is, Byrd didn’t name anything after himself. The people who were grateful for the money Byrd was able to appropriate named highways, buildings, schools, and programs in his honor. The record shows Byrd never pocketed a dime. Sagal, deliberately or not, made a small but significant error that serves to heighten our cynicism about our government and the people who “serve” us. Sagal wound up his fun with Byrd with the question that pointed to the fact that Byrd managed to locate a Coast Guard station in landlocked West Virginia that oversees the port of New Orleans, reminding me of those jolly propagandists on Fox News who use half-truths to disparage their targets and undermine confidence in leaders they oppose. Later yesterday evening, an in-depth report and commentary on Byrd, also on public radio, mentioned that the senator was ahead of his time in the wisdom of decentralizing the locations of our federal government. Mr. Sagal didn’t mention that the location of the Coast Guard office is less than two hours from downtown DC, an average commute for many Washingtonians. He also didn’t mention that West Virginia’s Eastern Panhandle is becoming heavily populated with happy refugees from metro D. C. Har de har har. My husband reminded me that Wait, Wait, Don’t Tell Me is a comedy show, that no one is spared. Okay. But today I am less inclined to chortle along with Mr. Sagal on Sunday mornings. I don’t trust him to base his humor on truth, even the truth of his perspective. He cheapened himself and his show in my eyes, and perhaps the eyes of others who know much more about Senator Byrd and his vision for the nation. What else might Mr. Sagal get wrong for the sake of a joke? The accomplished Mr. Sagal, according to the Google oracle, is an author, playwright, screenwriter and essayist as well as the host of the public radio show. I note that he attended Harvard. All kidding aside, I doubt Sagal would be worthy to shine Mr. Byrd’s shoes.